Borneo conjures up images of intrepid explorers, dense tropical rainforest, a dazzling array of tropical wildlife and of course, the great ape indigenous to this island, the orangutan. 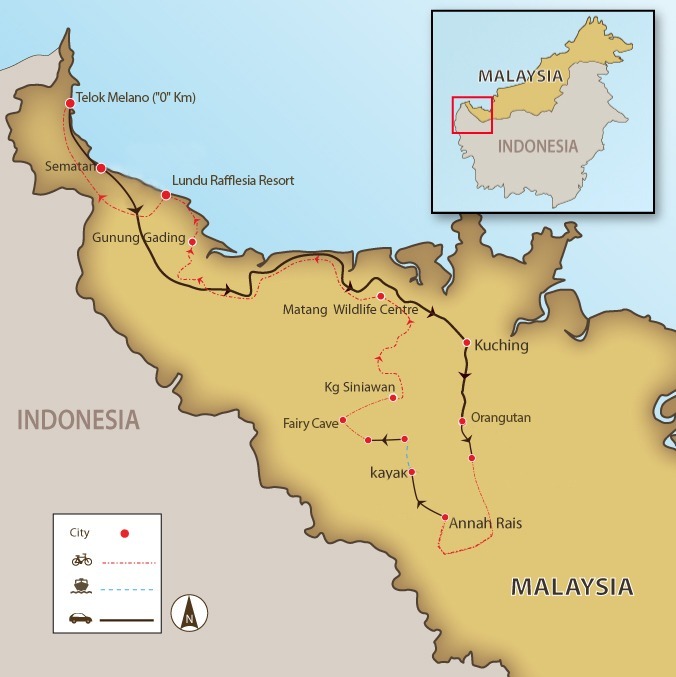 This week long cycling adventure takes in Kuching, the culturally diverse, lively capital of Sarawak; orangutan rehabilitation centres where you have a chance to get up close to these engaging creatures, kayaking along the languid Sarawak River, trekking along steamy jungle paths and witnessing the birth of baby turtles on the pristine beaches. The jungle adventures are very much the focus of the tour but we also have plenty of time to meet and interact with the friendly, fun and fascinating local indigenous people, as we stay in their houses and visit their villages. We meet you at the airport, and once settled in at the hotel, we use our favourite vehicles to explore the city. We bike to Kuching's oldest Chinese temple and continue along the river to the Astana, visiting the residence of the Governor of Sarawak and Fort Margherita. Our day starts with a visit to Semenggoh Nature Reserve, home for injured and orphaned orangutans. Then we cycle backroads through plan-tations, forests, rice fields, and farming villages. If lucky, we'll see the rare Raffelesia flower. We finish our ride at Annah Rais. We cycle through beautiful scenery to the Sarawak River and trade pedals for paddles. It’s a relaxing kayak downstream to a Dayak village for lunch. Then it's back on the bikes to ride to Siniawan, a town dotted with Chinese wooden houses. The road is flat but windy today, making it an easy and fun ride. We visit the Wind Cave Nature Reserve and follow Mt. Kubah to Matang Wildlife Centre for another chance to see orangutans in their natural habitat. We have a long ride today as we cycle along the coast to Lundu. At Gunung Gading National Park, we stop for a dip in a waterfall before riding to our beach resort. At the hotel, we'll have an opportunity see sea turtle hatchlings. We say goodbye to the baby turtles before heading out on a dirt backroad to the old trading post of Semantan. We arrive at the beach in time for lunch and have the afternoon free. Enjoy the sea before we drive back to Kuching. We take a cruise through the spectacular mangroves near Kuching to see exotic birds and animals before our farewell dinner. Depart Sarawak for a flight back home or you can extend your stay in Borneo. At just over 250km of almost entirely paved road surface, this is an excellent way to see the countryside in the Kuching District of Sarawak. Yes, there are some hills particularly on the first day and in the heat and humidity, this can be tiring, but after a few days this seems to be less of an issue. The guides and back up team (Danny, Mashor, Dominic and Sebri) we're excellent and fun to be with. Their knowledge in all things Sarawak was amazing. Wildlife rehabilitation centres, Wind Cave, Kayaking on the Semadang River, all enriched the experience. The first day's lunch at Danny's home was also a highlight as he explained all the various plants that they grow. Thank you to all the team. The knowledge, authentic care, pride, knowledge, and respect for the culture illustrated by the guides made this extraordinary and unforgettable experience that much richer. I just want to reflect how beautifully Danny and Dominic led us. We were only three, two guys and me, a female. So such a small team and such a gender ratio given the two guys were male could have made this an awkward trip. On the contrary, the sense of family, they ate with us, basically made themselves part of our journey, above and beyond, was felt and recognized by the three of us on the tour. That made this spectacular. Yes, the scenery, yes the cycling and the food and the culture. However, the highlight was the guides. Going to Danny's farm for lunch and meeting his family was fantastic. Having the longhouse experience, with the song and dance and intimate interaction with the people that live there was amazing. Going to the river to bathe there was an absolute dream. We all loved that moment. They were flexible, caring, adaptable, fun, informative, and just wonderful people. The kayaking was wonderful. I really commend the guides and hope that you recognize and appreciate their remarkable service. The portion of the ride along the beach was spectacular - something I couldn't imagine experiencing anywhere else in the world! This adventurous trip takes us off the beaten track as we explore the jungles, rivers, and villages of Sarawak. The trip starts in the capital Kuching, where we have the afternoon to discover the main sites before taking the bus the next day to visit the Semenggoh Nature Reserve. Here, we have our first taste of the jungle and its inhabitants, the orangutans, that Borneo is famous for. Our first ride takes us through fertile plantations on a quiet back road with a stop for a short walk through the jungle before arriving at the village of Annah Rais where we spend our second night. The next day we explore the great Sarawak River by kayak and meet and learn about the local indigenous people - the Dayaks on our way to Siniawan. With Mt. Kubah looming above us, we cycle to the Matang Wildlife Centre for another opportunity to spend time with the endearing great apes. The next day is one of the longest rides as we head beach side to Lundu, following the coastal road. We next head off the beaten track, riding a dirt road to the outpost of Semantan. Our last day takes us back to Kuching finishing with a delightful cruise around the mangroves. Suitability: The beginning of this ride has a few undulations and flattens out towards the end as we reach the beach. Although distances are not huge, the heat and humidity of equatorial Borneo ensure things feel hot. This is a journey through the finest terrain and scenery of Sarawak, with the best in nature and wildlife, ensuring you get the very best of everything from your cycling efforts. Biking Conditions: The road surfaces are mixed: most days we ride on a mix of bitumen village roads and some good quality tarmac roads. You will need a mountain bike, preferably one with front shocks. However, there is no technical riding involved on this tour. On arrival in Kuching, we transfer to our hotel at the edge of town. Kuching is a fascinating, bustling city with a mix of old and new world cultures. In the afternoon, we have a bike fitting and take a short ride along the waterfront, where the locals gather. We stop for a visit to Tua Pek Kong Temple, Kuching's oldest Chinese temple. We continue along the river to the Astana, visiting the residence of the Governor of Sarawak and Fort Margherita, built in 1879 to guard the city against pirates, the Steamship Building, and Court House Complex. We head back to the hotel early in the evening for a welcome dinner. An action-packed day lies ahead of us! It starts with a transfer to visit Borneo's Semenggoh Nature Reserve, a haven for injured and orphaned orangutans and one of the highlights of the tour. We arrive for the 9 am feeding, where wild orangutans join their friends for a free feed - a magical experience to see these great apes up close. After feeding time, we take a very short drive to the start of our ride, Panchor Dayak Hot Springs where we have time for a quick dip while the bikes are prepared. The cycling today is on a fabulous backroad that winds up and down, meandering around countless curves and bends. It takes us through banana plantations, betel nut tree forests, rice fields, and farming villages, giving us a real feel for rural Sarawak. We stop for a picnic lunch in a village and then take a gentle nature walk through a limestone rainforest, where, if lucky, we may see our first Raffelesia in bloom. These weird looking flowers are the largest in the world, but beware, they let off a rather nasty perfume! From here, it's just another 13 km to Annah Rais, where we spend our second night, and we end the day with another dip in hot springs to ease our tired legs! We are up early today for another full day of cycling, starting with a gorgeous trip down the river paddling kayaks. After breakfast, it's about an hour cycle through beautiful limestone scenery to the river. The adventure begins as we head out into the crystal-clear waters of the Sarawak River and have a relaxing paddle downstream. This is a great way to spot the river wildlife along the banks, like kingfishers and monkeys, so keep your eyes peeled. We stop for lunch at a Dayak village and have time for a look around and learn about the myriad local and indigenous plants that the Dayak use in cooking and as medicines. Then it's back on the kayaks to glide past more stunning limestone formations and the forest clad banks of this life-giving river. We disembark from the kayaks and jump back in the saddle for a mostly flat 29-km ride to Siniawan. Siniawan is a tiny town dotted with Chinese wooden houses where the locals are friendly and hospitable. We check into a simple guesthouse and reflect on our experiences over a cold beverage. Today it's back in the saddle for another full adventurous day. The road is flat but windy, making it an easy and fun ride. We visit the Wind Cave Nature Reserve with its intricate web of caves and follow the enormous sandstone ridge of Mt. Kubah on our way to Matang Wildlife Centre. Here we have our second chance to see enigmatic, rehabilitated orangutans in their natural setting. We overnight in the park, taking in the atmosphere and sleeping to the magical sounds of the forest. After breakfast, we prepare for a long but worthwhile ride. The route is mostly flat as we cycle along the coast to Lundu, crossing numerous creeks on narrow bridges. After a short break, we ferry across the Sampadi River to an isolated windswept beach, a perfect place for a refreshing swim. When we reach the sleepy but friendly town of Lundu, we have a delicious local seafood lunch. From here it's just a short ride to Gunung Gading National Park, where we can take a cooling dip in a waterfall or go for a quick jungle hike in search of the blooming Rafflesia. Our gorgeous beachside hotel is just 14 km away and has its own sea turtle conservation programme that protects nesting mothers. We can see the hatchlings and learn about these ancient creatures. After our own breakfast, we watch the baby turtles have theirs before we head out on a dirt backroad off the beaten track to the old trading post of Semantan. The shady road follows the coast, and our ride is relatively short and not too strenuous. We make it to the beach by lunch, and after a meal in a local restaurant, we have the afternoon free to enjoy the infinity swimming pool, swim in the ocean, or explore the local surroundings by bike. Enjoy your last morning by the sea and take a walk on the long beach to stretch your legs before we jump on the bus back to Kuching. The trip’s not over yet – in the late afternoon, we take a cruise through the spectacular mangroves near Kuching. Keep your eyes open for proboscis monkeys, dolphins, and, for those of you who are “twitchers”, the exotic birds that inhabit these wetlands. The finale is just after dusk when the fireflies come out to play for your evening’s entertainment. We end our tour with a group celebratory dinner and tales of our unique Borneo adventure. We head home but you can continue your Borneo adventure with a trip to Mulu World Heritage Park and its giant caves or even to the wilds of Sabah in North Borneo.